Take puff pastry out of the fridge and bring to room temperature. Preheat the oven to 200°C/425°F/Gas Mark 7. Wash, peel and slice the carrots into segments. Place in an oven-proof dish and drizzle over the olive oil, salt, pepper, and honey. Cook in the oven for 20 minutes, stirring every few minutes to coat evenly in the melted honey. Lay the puff pastry onto an oven tray, keeping it on the baking paper it came with. Use a pint glass or 9-10cm (31/2-4in) cutter to cut out circular bits of pastry and using a glass with a smaller circumference, make a light indent inside each circle and prick the pastry with a fork. Coat with a layer of Maille Wholegrain Mustard. Place carrots onto the pastry bases. Using a pastry brush coat the carrots with a little more olive oil, and sprinkle over a pinch of thyme. Finish by brushing the pastry edges with some beaten egg, then cook for 12 – 15 mins, or until the pastry is golden. to the rocket container. When the tartlets are cooked, wrap them in tin foil. When ready to eat, cover the rocket leaves with the dressing. 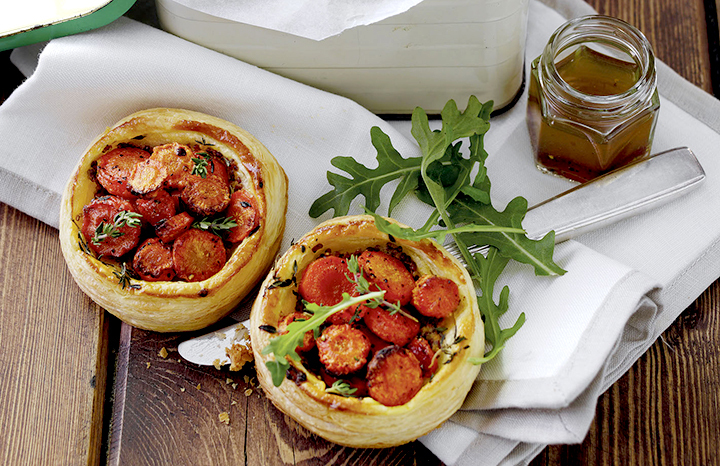 Top each tartlet with some the greenery and enjoy! Check out more recipe inspiration from @sophiemissing & @carolinecraig and head over to Maille for more mustard recipes. For more recipes grab the latest copy of Yours magazine.